Researchers: Jessica C. Hawthorne, University of Leeds; Michael G. Bostock, and Alexandra A. Royer, University of British Columbia; and Amanda M. Thomas, University of Oregon. 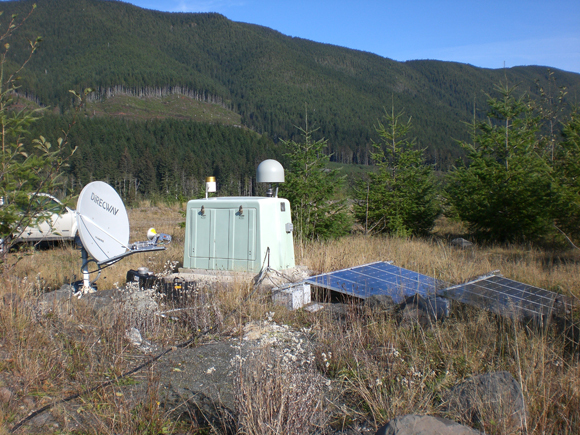 Analysis of 35 rapid tremor reversals (RTRs) captured by two Plate Boundary Observatory borehole strainmeters near Vancouver Island, British Columbia shows these subevents have high slip rates and modest strain energy release. RTRs contribute a significant fraction of the slow slip moment. In some locations they may account for most or all of the slip in the larger slow slip event. The Cascadia Subduction Zone is a major plate boundary along the northwestern coast of North America, where the Juan de Fuca plate subducts beneath the North American plate. The collision generates small and large earthquakes, some of which can generate damaging shaking and devastating tsunamis. Slip along the plate boundary can also occur without much shaking - in slow slip events, where a few centimeters of slip accumulates over a few weeks. This slow slip is accompanied by tremor, which likely consists of numerous tiny earthquakes that roughly track the location of slip in slow slip events. The past decade of observations has revealed that the pattern of slip in slow slip events can be quite complex. Within each slow slip event, there are subevents such as rapid tremor reversals (RTRs). In RTRs, tremor locations migrate 10 to 50 kilometers back through the slow slip region over the course of 2 to 6 hours. Understanding these subevents could be an important step for determining the physical mechanisms that govern slow slip events. Of particular interest is why RTRs propagate so fast. They move around 10 kilometers per hour, rather than 10 kilometers per day like the main body of the slow slip event. This study estimates the properties of aseismic slip that are associated with RTRs. 35 RTRs were examined using borehole strain data from two instruments (B003 and B004) located in northwestern Washington. The strain rates at the boreholes increase during the 35 RTRs as a result of more rapid slip at depth. The total moment in each RTR is estimated to be equivalent to a moment magnitude 5.0 to 5.1 earthquake. The whole slow slip event is roughly 100 times larger, equivalent to a moment magnitude 6.4 to 6.7 earthquake. RTRs occur about once per day and may accommodate 10 to 20 percent of the moment in the slow slip event. In some locations, most or all of the slip in the slow slip event may occur during RTRs. The RTR subevents have higher slip rates and smaller stress drops than the total slow slip event. The higher slip rates and smaller stress drops likely contribute to the increased migration rates observed in RTRs. These RTR properties represent one more constraint that can help to determine why some parts of the plate boundary slip in slow slip events, not in large earthquakes. Hawthorne, J. C., M. G. Bostock, A. A. Royer, and A. M. Thomas (2016), Variations in slow slip moment rate associated with rapid tremor reversals in Cascadia, Geochem. Geophys. Geosyst., 17, doi:10.1002/2016GC006489.